Hello! 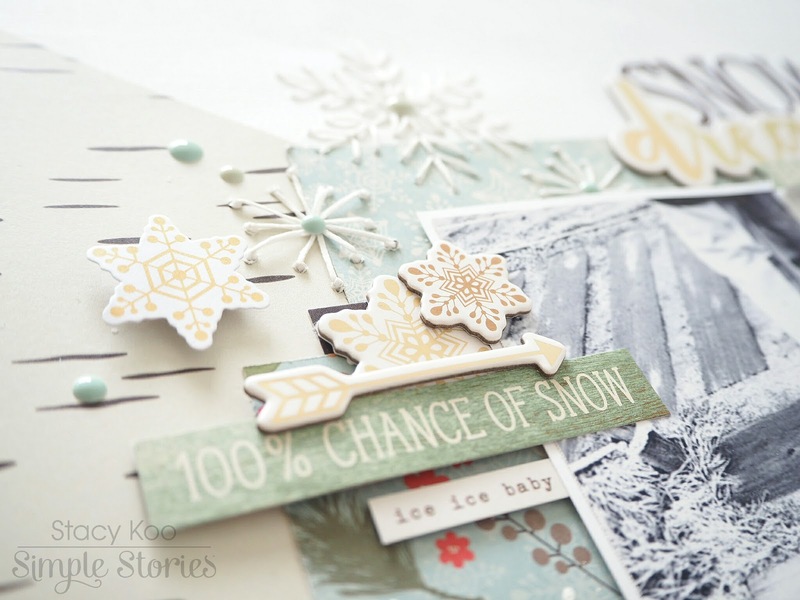 I am on the Simple Stories blog today sharing 2 layouts using the 'Winter Wonderland' Collection! This collection has inspired me to do some quick stitching and include some photos with snow. This is the first layout I put together. I loved how this piece came together. 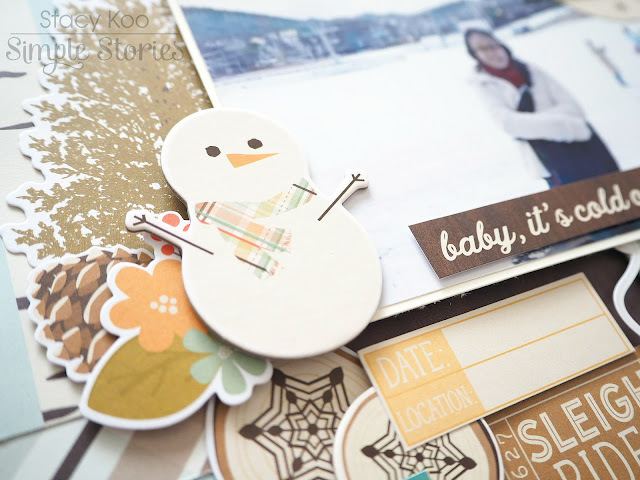 I started with layering the pattern papers. These layers “frame” the photo and highlights my black and white photograph to give it a good emphasis. Next, I started to add some stitches to opposite corners with different snowflake designs. 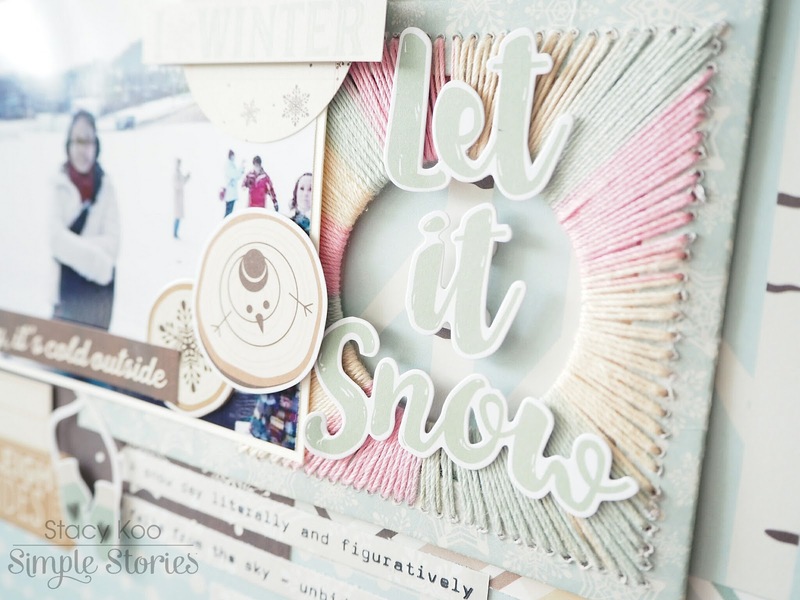 Stitching it in white helps to give some texture, yet not over cluttering the area so the embellishments can play its main role in the layout. I have also added some enamel dots to the centre of the stitched snowflakes. Such a pretty sight! On the opposite end, I had also stitched some snowflakes. 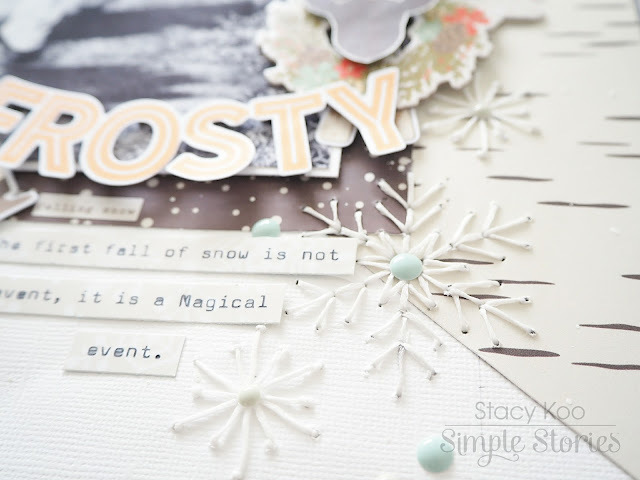 In addition, I have layered more snowflake embellishments from the Bits and Pieces as well as the 6x12 Chipboard. Of course I had to add some sentiments to this cluster! Gosh, the 4x6 sticker packs a very good range of words and phrases! 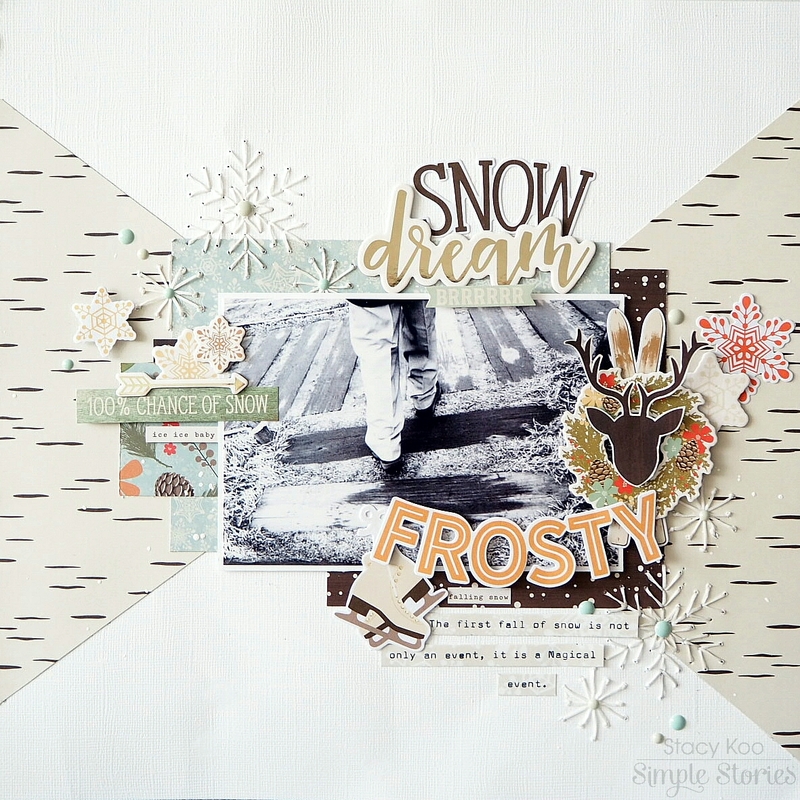 I titled this layout snow dream. 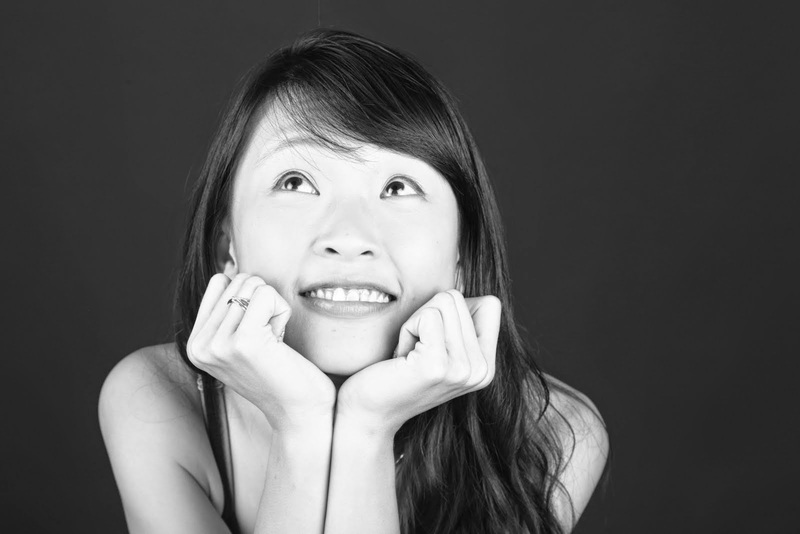 I reside in Singapore, where it is really summer all year round. We don’t get snow here in Singapore. Oh how I wished for 4 seasons here (especially snow! ) The chipboard piece ‘Snow’ looks familiar? I could not help but used this piece from the POSH collection! There are many goodies in this collection. 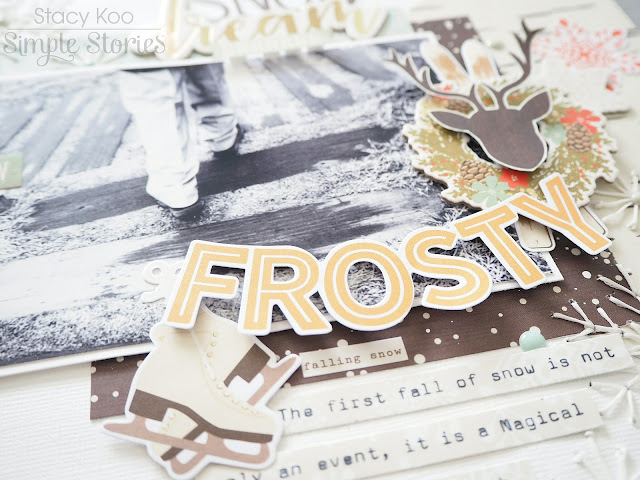 Personally, I love to fussy cut the fun and beautiful images from the 3x4 Journalling Card Element pattern paper. Couple it with the christmas wreath and it gives such a good decoration! For the other layout, I decided to really challenge myself with some more stitching to showcase a sub-title. 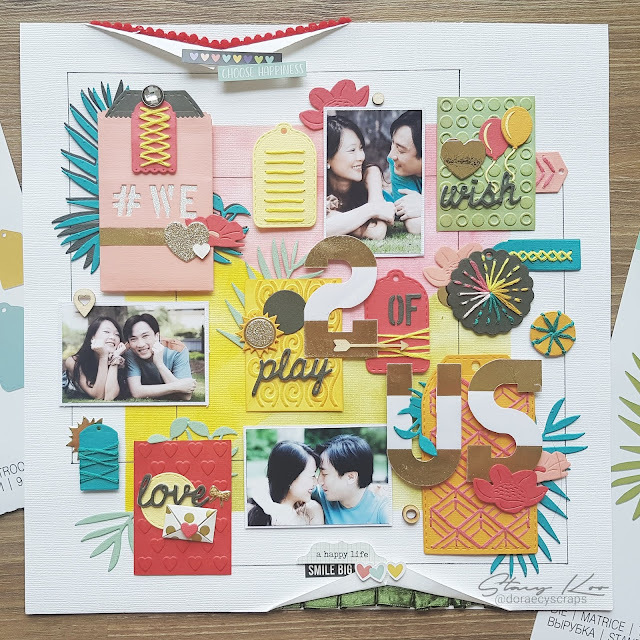 From the first time I saw this set of words from the Bits and Pieces pack, I knew I had to make use of them on one of the layouts. I also wanted to highlight these words so I took some chipboard, yarn and started sewing round and round. You can really see through the stitching (vaguely) so the beautiful pattern papers are not totally covered. It also helps me focus on the set of words which I placed on top of each other. Because of the circular element I had used in the stitching, I also used embellishments from the collection with circular elements to match. Another circular element to highlight these cute mittens here! I wondered if the snow fun referred to the photo or the cute mittens? This collection brought me much joy! I love the soft colors of this collection! Hope you have enjoyed the walk through and here’s wishing all of you a Merry Christmas with lots of joy and laughter for the season!